In a previous life, I was tasked with guiding the content efforts for a marketing department on the threshold of building a massive inbound marketing strategy. I had been petitioning to get HubSpot Marketing as our marketing automation platform for months — if not years — stalking their website and blog like a true fangirl. I watched all the demo videos, took notes, talked to users, took whatever courses HubSpot Academy would allow me, and reviewed my notes again—for fun. The day we finally started using HubSpot, we celebrated and got to work right away. We built templates, transferred our posts to the new blog, crafted a few workflows, hit “publish” on some landing pages, and were off to the races. We bought HubSpot to become inbound marketing mavens. Instead, we found ourselves still stressed, struggling to bring in leads, and, quite frankly, fed up. We felt like our new toy was broken. What went wrong? It didn’t take us long to learn that HubSpot was a really cool tool, but not at all a magic bullet to solve the world’s marketing woes. There’s no denying that a great piece of software can make your life monumentally easier. It can keep you better organized and make you more efficient and productive overall, but software is only going to take you so far. It is the means to an end; the brawn to strategy’s brains; the beast to strategy’s beauty. Before you can put HubSpot or any tool to use, you need to frame your strategy so you know exactly what you need your tools to actually do. This sounds obvious—of course, you need to have goals—but dissecting the specifics of your goals is heavy and crucial lifting in this process. Setting goals involves both a look back at where you’ve been (what’s worked and what hasn’t) and where you want to go. What is the desired outcome of this strategy? What is the risk in this approach? What is your budget for achieving this? Once you’ve documented your answers to these, you can map them to the Value Journey Canvas. This will help you understand where the successful outcome of your goals hits your prospects in their buyer’s journey. For example, a goal of increasing website traffic maps to Attract/Engage and a goal of increasing sales tracks to Convert. You won’t know if you hit your goal if you don’t track it. In this step, you’ll assign key performance indicators (KPIs) to each goal. While KPIs are unique to the goal they’re attached to, there’s a formula to creating them. Each KPI should be SMART (Specific, Measurable, Attainable, Relevant, Timely), so that you have definitive guidelines that indicate whether or not your KPI is on track. If you’ve established the goal of increasing website traffic, for example, a SMART KPI might be to increase the number of visitors to the site from 10,000 to 11,000 within 30 days. While your goals may be lofty, your KPIs can be much more incremental. They’ll keep you driving toward the ultimate goal. Because KPIs leave zero room for guesswork, they’re also a firm indicator of how you’re performing as you implement your strategy. Now, here’s the fun part: where strategy meets software. You’ve figured out where you want to go and how you’ll track your progress. The next step is to plan exactly how you’ll get there. What are the tools you’ll use to put your plan in place? Your tactics may include blogging, technical SEO, or paid social ads for goals in the Attract/Engage stage of the Value Journey Canvas; or if your goal is around conversion, you might want to throw landing pages and calls-to-action (CTAs) into your tactical bucket. If you’re like I was, you’ve been dreaming for a while about all the ways you’ll use HubSpot to make your marketing dreams come true. This is the step where you’ll outline exactly what needs to be done to hit your goals with how you’ll do it with HubSpot. Note: In many cases, your tactics will take on additional KPIs. For instance, if you’re plan is to blog in order to increase site traffic, create a KPI that defines the frequency you’ll publish. The more granular you get with your KPIs, the better. This lets you monitor your progress and gives you space to celebrate if you’re on track or make changes to fix what’s not working (so you can celebrate later). The Inbound Marketing Sample Strategy contains tons of examples and a template you can use to create KPIs and plan your tactics. Next, you’ll bring it all together with a campaign plan, where you’ll document your goal, your target persona, the stage of the Value Journey you’re reaching, the tactics you’ll use, and how you’ll measure your success along the way. It’s a good idea to build an annual strategy as an overview, but to stay flexible enough on a quarterly basis so you can respond to market changes and keep your KPIs progressing consistently. While an annual plan can help you identify and track the big picture goals you want to meet, incremental planning gives you control over how you respond to your own data. By breaking up your planning into manageable chunks throughout the year, you can better measure the success or failure of what you’ve executed on—and then adjust your plans from there. The Inbound Marketing Strategy Template & Example also contains sample campaigns and templates to get your strategy off the ground. What makes HubSpot so powerful—once your strategy is in place—is its capacity to allow you to treat people like, well, people. From the ability to foster Conversations to using smart content and workflows to create personalized experiences, the software gives you the power to create relationships with the people you’re reaching. As you work through the steps, remember that any inbound marketing strategy worth its salt is, at its core, helpful, honest, and sincere. IMPACT created the Inbound Manifesto that outlines just how powerful this approach can be. Check it out, download it, and hang it on your wall for a daily dose of inspiration. Back in the day and several months after my old team realized it needed a strategy and went through the steps of building one, we saw our traffic increase, our contacts convert, and our sales pipeline grow. Our strategy guided our actions and HubSpot allowed us to connect with people in new, consistent, and trusted ways. It was the right tool for the job—but the job was something we had to determine on its own. Your prospects and customers—your people—aren’t interacting with HubSpot, they’re interacting with you. 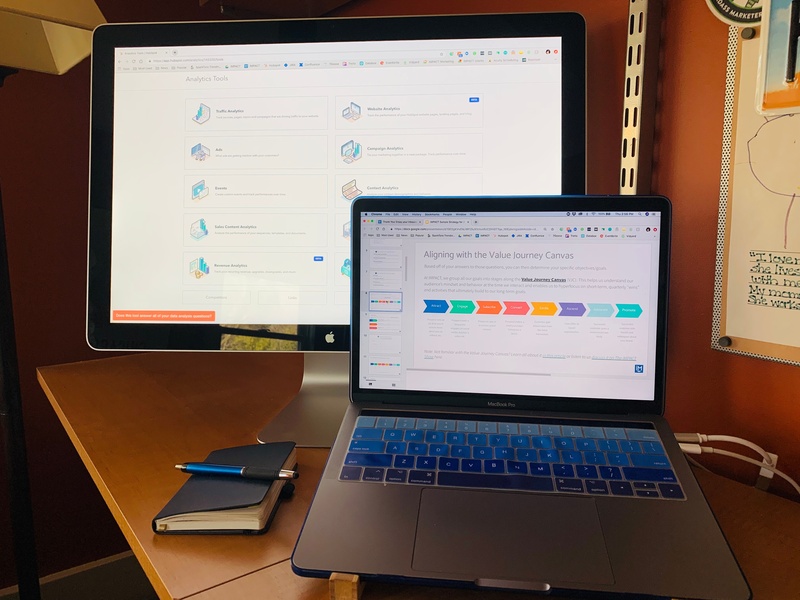 Whether you’re using HubSpot or another software, you need to make sure that, at the end of the day, the tool you choose is a match for fostering that relationship and achieving your existing goals. Need help setting goals, creating KPIs, and building campaign plans? Download the Inbound Marketing Strategy Template & Example to get started.